Childhood trauma is often overlooked, greatly misunderstood, and one of the most damaging things that can happen to a child of any age. It is also far more common than most of us realize. Encompassing everything from natural disasters, abuse, witnessing violence, medical related trauma, loss of a parent or loved one, neglect, bullying and more. The effects can last a lifetime, leading to mental illness, behavioral struggles, addiction, and cycles of trauma that can span generations. Childhood trauma is not something I ever expected to face in my life. Not in the way it has become a constant presence in my days. I have my degree in psychology, specializing in cognition, memory and learning… in the elderly! See my focus when I was in University was in aging and dementia. Childhood issues were not on my radar. Then one day, approximately 15 years later, I traveled to Ethiopia and held my 10 month old son for the first time. I knew the moment we met that we were launching ourselves on a journey that we never expected. Within a year, I was working with therapists and psychologists and psychiatrists regularly. Finding help for a child who experienced complex, prolonged trauma from infancy is extremely hard. 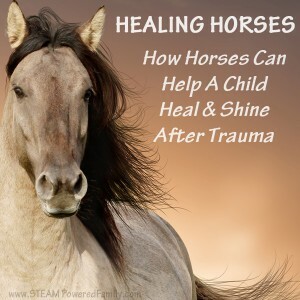 Most of the trauma therapies focus on talk therapy, but that doesn’t work for children who have been fundamentally altered in their brain chemistry and development due to trauma. I returned to school, taking classes in childhood mental health and development. Researching and reading everything I could find on the topic of childhood mental health. I was determined to help my son. Something in my gut told me time was against us. This wasn’t something he would outgrow or that would pass with time. He needed help now and I was going to make sure he got it. It was through courses I took in childhood trauma that the concept of the Trauma Tree came into our lives. The phrase, “at least he was too young to remember”, infuriates me. It is a lie. Completely and totally. Saying it only serves to harm trauma children even more. 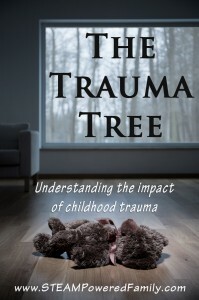 If more people understood the concept of the Trauma Tree, they could see how trauma harms children and leaves lasting damage. Life with a history of trauma is hard. It is always there. A part of your every day. You can learn to deal with the triggers, but eliminating all the triggers in life is impossible. For many days are spent constantly on high alert. Trauma becomes a part of who you are and colours everything you see and do. One of the questions I’m often asked by struggling parents is how to know if their child had experienced childhood trauma. For adoptive families and foster families, it is very easy to simply say, “yes, trauma is part of the issue,” but the varying degrees of trauma and how they impact each child makes it very hard to quantify and define. Sadly, there are also families where there is no known trauma when behaviors and issues start to show. It is only after investigation that it turns out there has been bullying, abuse, or other traumas occurring that were not known. 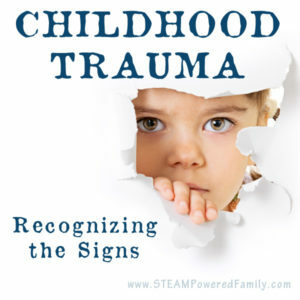 Even for children who have experienced prolonged, complex trauma, the effect of a trauma anniversary can be pronounced. Certain dates in their trauma past may hold special significance in their minds, causing behaviors and struggles to intensify during the anniversary. For children who experienced a single traumatic event, knowing the date can help families prepare so they can offer additional supports and understanding as the anniversary draws near. But for those children with complex trauma histories, it can take years of tracking behaviors and cycles before certain anniversaries can be identified. 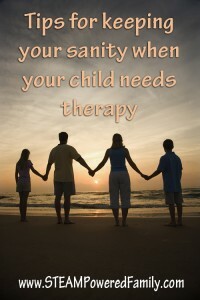 One of the most important things a family needs to find to help them and the child cope with trauma is quality therapy. It can be hard constantly advocating for your child, especially when behaviors are intense and sadly, many therapists are not well versed in childhood trauma. But finding the right support can be life changing for a family, but most especially the child. Due to the lack of resources and supports for children with trauma history it can be very helpful to look to services that are helping veterans and adults with PTSD. Search out services that think outside of the box to find what will help the therapist really connect with the child. We tried play therapy, art therapy, but it was finally animal assisted therapy that allowed us to help my son and bring him some healing. 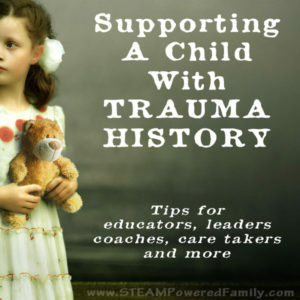 Supporting a child with trauma history becomes an important function for all the people in the child’s life. From parents, to family members, teachers, coaches and more. Being trauma informed will help these children feel safe, build trust, and start to flourish and grow. 60% of children will experience trauma. 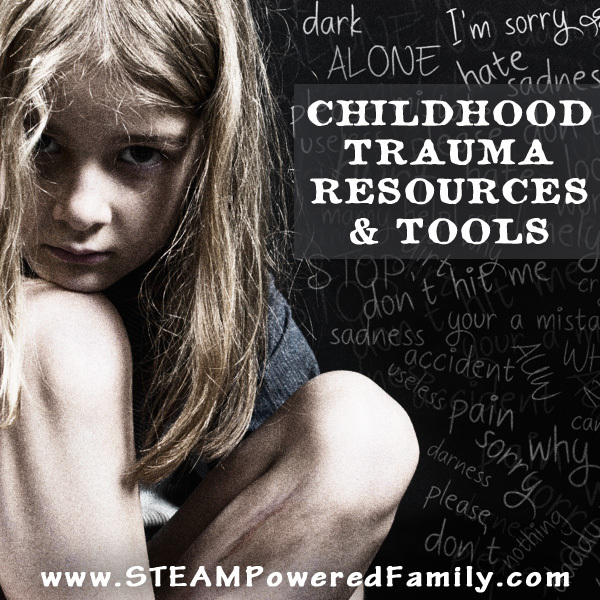 If you work with children, being trauma informed is critical for their well-being and healing. One of the biggest struggles I’ve faced as a adoptive parent of a child struggling with childhood trauma, is the pain over knowing I wasn’t there to protect him. It’s a pain that hits me at my core and can make it hard to breathe in those moments when the struggles are intense. The hurt that my son lives through daily because of what happened in his past, haunts me. Build An Anti-Anxiety Toolkit – This article goes to a fellow trauma momma’s site. We have built our own anti-anxiety toolkits and highly recommend it. Exposure to trauma affects children physically as well. One of the most common issues I hear parents struggling with is bed wetting at night. This is extremely common in children with trauma history, and well beyond the normal age when they should be able to remain dry. Our fantastic family doctor gave us some advice on the issue that made all the difference. Trauma is complex. It affects our brains, which is the one organ scientists and researchers are still studying and trying to understand. Our brains are fascinating and complex. 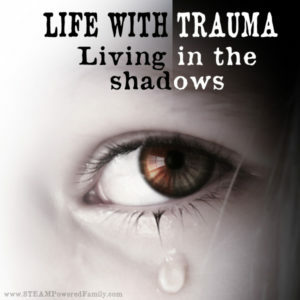 The impact trauma has on all those connections is not fully understood but progress is being made. It helps to connect with other families and parents. To join support groups. Read the work of leaders in the field. With that in mind here are even more resources to help you. 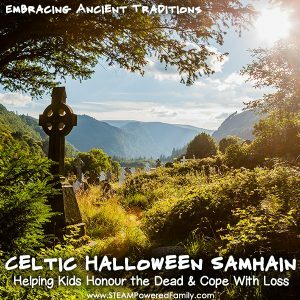 Helping Children Cope with Death and Loss with ancient festivals like Samhain can be very beneficial. Taking the time to honour and remember those we have loved and lost. Working together, children can learn healthy coping skills. A fantastic guide to understanding childhood trauma for parents and caregivers from the American Academy of Pediatrics. 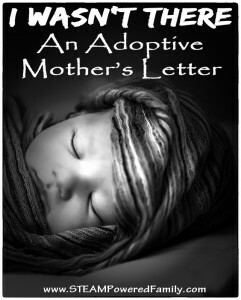 My own fiction novel draws on the experiences of myself as a mother of a child with trauma history, plus the experiences of other families and speaking to many wonderful therapists over the years. Shattered Embrace is a fictional account of a very real struggle.